Wstęp. Ważne zagadnienie z punktu widzenia klinicystów i pacjentów stanowią niepożądane działania polekowe. Obejmują one wiele układów i narządów oraz implikują dalsze postępowanie terapeutyczne. Jednym z nich jest łysienie polekowe, którego mechanizm nie zawsze pozostaje jasny i w wyraźny sposób wiąże się ze stosowanym lekiem. Częstość występowania tego zjawiska u ludzi w skali ogólnej nie jest znana. Cel pracy. Celem doświadczenia była ocena wpływu atorwastatyny i perindoprilu na przebieg cykli włosowych w wariancie doświadczalnym na zwierzętach laboratoryjnych. Materiał i metody. Szczury szczepu Wistar podzielono na równe liczebnie grup. Szczury pierwszej grupy (K1) otrzymywały wodę destylowaną, zwierzęta w grupach badanych (G1, G2) otrzymywały po rozpuszczeniu w wodzie destylowanej, sondą dożołądkową wybrane leki. W trakcie badania dwa razy w tygodniu dokonywano oceny makroskopowej owłosienia oraz wykonywano trichogram. Na podstawie proporcji włosów anagenowych, katagenowych, telogenowych, dystroficznych oraz niesklasyfikowanych wnioskowano o rodzaju łysienia lub jego braku. Dodatkowo wykonano wybrane badania laboratoryjne. Wyniki. We wszystkich analizowanych cyklach w grupach otrzymujących badane leki stwierdzono przedwczesną inwolucję katagenową i zwiększenie odsetka włosów telogenowych, bądź wzrost liczby telogenowej. Wnioski. Badane leki wpływają na przebieg cykli włosowych i odpowiadają za rozwój łysienia polekowego, o zmiennym przebiegu zależnym od czasu ekspozycji. Introduction. Adverse drug reactions play an important role. Often they are severe, impact many organs and further treatment is always determined by their occurrence. One of them is drug induced alopecia. This side effect mechanism is still unknown. Furthermore drug toxicity is not always evidence. Moreover drug induced alopecia frequency in human is undefined. Aim. The aim of this study was to asses if atorvastatin and perindopril induce changes in hair cycling in rodent model. Material and methods. Male Wistar rats were divided into equal groups. Rats in control group (K1) received distilled water. Rats in experimental groups (G1, G2) received orally, via gastric tube selected drugs dissolved in distilled water. Twice a week macroscopic examination was obtained, followed by microscopic examination of the hair for shaft and root abnormalities. Anagen, katagen, telogen and pathologic types of hair were counted. Depending on telogen count and dystrophic hair appearance the diagnosis was establish. In addiction laboratory test were taken. Results. Selected drugs induced premature catagen involution and increased the telogen count or only increased telogen count in modified cycles. Conclusions. Selected drugs influence the hair cycle. Observed drug induced alopecia depends on time of exposure. Słowa kluczowe: cykl włosowy, wypadanie włosów, łysienie polekowe. Key words: hair cycle, hair loss, drug induced alopecia. In today’s world medical progress is enormous. The pharmaceutical industry introduces a number of therapeutic agents that have many side effects including drug-induced alopecia. It’s mechanism is not always known and clearly associated with the drug. The aging of the population, multidrug therapy, coexisting diseases and the basic factors blur the picture. Taking into account the mechanisms of hair follicle damage induced by drugs, telogen effluvium is foreground hair loss. It occurs mostly after several months of treatment and sometimes it is difficult to define whether effluvium is the result of the therapy or is associated with an underlying or concomitant disease. In human hair loss usually runs subclinical leading to a loss of less than 50% of hair and mostly affects the scalp. Classic anagen effluvium, is observed less frequently. It’s pathogenesis is associated with inhibition of mitosis in the hair follicle mainly by chemotherapeutic agents or heavy metals. Runs, always with the clinical manifestations because about 85% of the scalp hair are in anagen phase and stand as potential target for toxic factor. Sometimes we can also observe mixed alopecia arising in a case of coexistence of both mechanisms. Atrovastatin is a statin used in the treatment of symptomatic primary and secondary hyperlipidemia caused by: uncontrolled diabetes, alcoholism, renal failure requiring dialysis, obesity, glucocorticoid therapy, nephrotic syndrome, hypothyroidism, cholestasis, diabetes, pregnancy. One of the statins side effects is hair loss observed in 1-5% of patients. It is usually temporary and affects both the scalp and other body regions (1, 2). All diseases treated with statins affects the hair condition by themselves therefore these observations require trichologic confirmation (3). Perindopril belongs to ACE inhibitors and drug-induced hair loss occurs in 1-5% of treated patients. According to available data, it is observed both in adults and children. Hair loss usually affects the scalp, and its mechanism remains unclear (4, 5). This drug is often used in multidrug regimens in the treatment of hypertension or renal dysfunction where other therapeutics often are burdened with negative effects on hair condition. In addition, this drug seems to be interesting because of its immunomodulatory properties and test its application in many diseases. The study was conducted in male Wistar rats at the age of 30 days and body weight of 68.35 g+/-9.62, derived from Experimental Medicine Centre of Medical University of Silesia in Katowice. The animals had free access to water (filtered) and feed (standard). Environmental microclimate was characterized by stable parameters: temperature (about 20°C), humidity (60%), air movement and rhythm of light (12:12 hours) with the circulation of 6:00 and 18:00. During 96 days, the rats in groups G1 and G2 received daily via gastric tube following drugs: G1-atorvastatin (30 mg/kg per day), G2-perindopril (2.0 mg/kg per day). Rats in the control group K1 received distilled water (2 ml/kg per day). The drug dose was based on available publications, where selected drugs were used in rodent model to achieve therapeutic effects typical for humans. The LD50 (dosis lethalis media) according to the MSDS (Material Safety Data Sheet) and drugs half-lives (T 1/2) were also taken into account. Three times during the experimental period (day 1,32,64), induced hair cycles (I, II, III) were performed by manual epilation of the 10x10mm field in sacral region in each animal. Simultaneous in opposite sacral region spontaneous hair cycles I, II and III were observed. Microscopic evaluation was performed on 1, 4, 8, 11, 15, 18, 22, 25, 29 and a 32 day of the hair cycle, both induced and spontaneous through the trichogram. Therefore about 100 hair were plucked, embedded in medium, observed under light microscope with 4 x 10 magnification and the number of hair in the different phases of the hair cycle were determined. The diagnosis of hair loss was establish basing on the proportions of different types of hair. Macroscopic evaluation carried out in analogous days was based on hair density, thickness, color, gloss and mechanical strength. Moreover in 1, 48, 96 experimental day blood samples were taken for testing. After completion of the experiment the rats were euthanized by intraperitoneal administration of sodium pentobarbital at a dose of 200 mg/kg and utilitized. In all tests the level of significance α = 0.05. The study was approved by the Local Ethical Committee for Experiments on Animals Affairs of Medical University of Silesia in Katowice, No. 68/2009 dated 10.09.2009. To demonstrate the differences and similarities in hair growth, we compared group K1 and G1, G2 (induced and spontaneous cycles (I, II, III)). The surveys included following days: 15 (anagen VI), 25 (catagen) and 32 (telogen). In addition, statistical analyzes of laboratory results was obtained. In the control group K1, where animals received distilled water, induced and spontaneous hair cycles I, II, III were correct. Regrowth after epilation was not delayed and all cycles lasted for 32 days. Comparison of induced cycles within the group, pointed out changes between I and II hair cycles and similarities between II and III hair cycles (tab. 1, 2). It was associated with onset of catagen between compared cycles (day 25 in I hair cycle and 22 in II and III). The observed different time of hair follicles involution was physiological and associated with animals age. Table 1. Comparison of I and II induced cycle in group K1 (observed probability). Table 2. Comparison of II and III induced cycle in group K1 (observed probability). 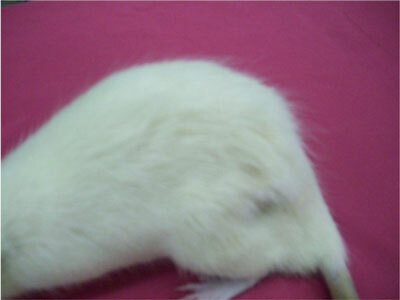 Macroscopically animals fur remained fluffy, thick and white throughout the experiment and the rats grew normally. The course of induced and spontaneous hair cycles showed telogen effluvium in this group. Dynamics of the process showed remission of the hair follicle damage in time, observed in both cycles (tab. 3, 4, fig. 1, 2). Table 3. Comparison of I and II induced cycle in group G1 (observed probability). Table 4. Comparison of II and III induced cycle in group G1 (observed probability). Fig. 1. Anagen hair distribution on day 15 in I, II and III induced hair cycle in group G1. Fig. 2. Telogen hair distribution on day 25 in I, II and III induced hair cycle in group G1. At the beginning macroscopically no changes in hair growth were observed because of subclinical course of the process. However during the third hair cycle reduce the fluffiness and shedding of hair on the animals back were observed (fig. 3). Fig. 3. Rat fur in III hair cycle in group G1. Obtained laboratory tests showed no differences in comparison to the control group K1, that might have been consequence of the therapy. Based on the course of the spontaneous and induced hair cycles the relationship between telogen effluvium and perindopril intake was proven. The hair loss evolved slowly during the experiment. There were only slight differences between tested and control groups during the first spontaneous and induced hair cycles. It was due to premature hair follicle involution not followed by the telogen synchronization. II and III induced and spontaneous hair cycles showed progression of the hair follicle destruction. The premature hair follicle involution was followed by the telogen synchronization and showed toxic effect of the drug responsible for the alopecia. Analysis of the induced and spontaneous hair cycles in time confirmed time related hair follicle destruction, leading to the chronic drug-induced alopecia (tab. 5, 6, fig. 4, 5). Table 5. Comparison of I and II induced cycle in group G2 (observed probability). Table. 6. Comparison of II and III induced cycle in group G2 (observed probability). Fig. 4. Anagen hair distribution on day 15 in I, II and III induced hair cycle in group G2. in I, II and III induced hair cycle in group G2. Fig. 5. Telogen hair distribution on day 22 in I, II and III induced hair cycle in group G2. Described above observations were also observed macroscopically by the shedding of the fur on both body sides during the III hair cycle in all animals (fig. 6). Fig. 6. Rat fur in III hair cycle in group G2. There were no relationship between observed alopecia and conducted laboratory tests. Experiment results proved the relationship between selected drugs intake and drug follicle destruction followed by the effluvium. Atorvastatin in daily dose of 30 mg/kg is responsible for drug induced alopecia in rodent model in both hair cycles. The observation of the spontaneous and induced hair cycles in time at the beginning indicated the strengthens of the hair follicle destruction followed by the spontaneous remission. Available literature case reports of statins-induced alopecia reflected our findings. Segal et al. (6) reported that 38 year old female suffered from nephrotic syndrome developed alopecia after atorvastatin therapy due to high total cholesterol levels. The hair loss was reversible after cessation of treatment however developed again during another course of treatment. Despite this, it is important that there is coexistence of nephrotic syndrome and benazepril intake. It is known that these factors also play a role in the process however author negate relationship between observed alopecia and these facts (6). Mechanism of statins-induced alopecia remains unclear. It is probable that lipid lowering agents affects the carbohydrate regime. In the article published in Practical Medicine (7) the relationship between statins intake and diabetes occurrence was discussed. As it was obtained in JUPITER trial patients submitted to rosuvastatin treatment in daily dose of 20 mg revealed more diabetes than placebo patients. Moreover there was no difference in fasting glucose concentrations between groups, while there was observed minimally but significantly higher percentage of HbA1c (glycated hemoglobin 1c) in the first group. In the study PROVE IT-TIMI 22 the similar effect was observed in patients treated with atorvastatin in daily dose 80mg. Koh et al. in 2011 discussed (8) the influence on statins on metabolism. They suggested previous that some statins either did not alter insulin sensitivity or promoted insulin resistance despite significant improvements in endothelial dysfunction and decreases in circulating pro-inflammatory markers. This may be due to pleiotropic or off-target effects of some statins to cause insulin resistance by diverse mechanisms unrelated to endothelial dysfunction. Beside that they proved differences between different statins, with pravastatin promoting risk reduction for onset of diabetes. On the other hand atorvastatin, rosuvastatin, and simvastatin all promote significant increase in this risk. It is known that diabetes influences the hair condition and is responsible for telogen or mixed effluvium. Clinically hair loss is severe, affects the scalp, especially the apex and usually is prior to diabetes onset. What’s important severity of the process does not depend on duration of diabetes and effluvium but on glycemic control. These conclusions refer to the observations made by Kostanecki (9). He showed that experimental diabetes in rats affects the hair cycle, causes significant prolongation of telogen and delays induced anagen appearance. The conducted experiment revealed analogous results during II induced hair cycle and observed hair follicle damage was severe. The inverse effect of statins on hair follicles seen by other researchers is also worth to discuss (10). In published case report atorvastatin in daily dose of 40 mg and ezetimibe in daily dose of 10mg due to hyperlipidemia treatment induced hair regrowth in 54 year old female patient suffering from alopecia universalis. Interestingly, the simvastatin was used previously alone but no hair regrowth was observed. So that, this observation proved synergistic, immunomodulatory effect of these drugs on hair follicle. Above discussion shed new light on the impact of the selected drug on the hair cycle, and undoubtedly indicate a significant need for further research on the entire group of statins. Perindopril, angiotensin converting enzyme inhibitor was another chosen drug. The conducted research indicated relationship between perindopril intake and hair follicle destruction leading to the telogen effluvium. In study group I hair cycles, both induced and spontaneous showed little abnormalities in comparison to control K1 group, and hair follicle destruction evolved slowly. Our observations based on the experiment confirmed available case reports of ACE inhibitors-induced hair loss (11-13). Moreover there was evidenced relationship between drug intake and hair loss, that wasn’t clear heretofore. Jochum et al. (11) data suggested coincidence between ACE intake and drug-induced alopecia however patients were admitted to multidrug therapy including: metoprolol, bisoprolol, digoxin, furosemide, hydrochlorothiazide, doxazosine, that wasn’t meaningless. Patients developed severe hair loss after 4 months of enalapril or captopril therapy, that resolved after cessation of treatment. Our experiment confirmed that prolonged ACE inhibitors intake leads to hair shedding and also specify the dynamics of the process. The pathogenesis of ACE inhibitors induced alopecia unfortunately remains unclear. However it is known that all ACE inhibitors have a functional group that binds zinc in active site of the enzyme and some adverse reactions occurring during ACE inhibitors therapy such as skin reactions, alopecia, taste acuity are specific for patients suffering from zinc deficiency. Zinc is essential for the many metalloenzymes function including: carbonic anhydrase, alcohol dehydrogenase, lactate dehydrogenase, phosphatase. It is also a component of many transcription factors and is essential in some proteins synthesis. Zinc builds skin and hair in human and zinc supplementation is used in acne, atopic dermatitis and alopecia areata treatment. In the rare disease entity that is the acrodermatitis enteropathica patients have no ability to absorb zinc. Acrodermatitis enteropathica is a rare disorder affecting the zinc uptake. Clinical outcomes include periorificial and acral dermatitis, skin apendages involvement-hair loss and paronychia. Varying zinc levels leads to so called zebra hairs appearance. These changes are often accompanied by tongue and oral mucosa inflammation followed by taste disorder-hypogeusia also seen in patients treated with ACE inhibitors. According to this theory, Golik et al. (14) have attempted to assess the impact of captopril and enalapril on serum, urine and intramonocytic zinc levels in hypertensive patients. They found that chronic captopril and enalapril therapy results in decrease in intracellular zinc levels in the absence of changes in serum. Moreover, zinc contained in blood cells is a much better indicator of tissue content of this element. The clinical implications of this phenomenon indicated Abu-Hamdan et al. (15). He suggested that abnormalities of taste are commonly associated with captopril therapy and may be related to decreased serum zinc levels and higher urinary zinc excretion. Zumkley (16) also reported that ACE inhibitors therapy leads to serum zinc deficiency that probably plays a role in side effects occurrence. After 4 and 8 weeks of treatment the experiment revealed that selected drugs lead to zinc deficiency and higher zinc urinary excretion. Moreover after 8 weeks of therapy zinc serum level decreased more significantly in captopril group. This observation indicates the effect of both drugs on zinc metabolism and level. In rodent model, using guinea pigs the influence of ACE inhibitors on zinc levels was also studied (19). During 9 weeks of experiment animals received 2 mg of captopril intraperitoneally. Afterwards zinc levels were determined in indicated tissues. The hair zinc concentration was significantly decreased. It confirmed the role of perindopril in zinc metabolism and in alopecia occurrence. Especially due to fact that, hair loss in rats is related to zinc deficiency (9). The subject of this discussion remains the role of functional groups in aspect of drug-induced alopecia. Leaker and Motel (12, 13) indicated relationship between captopril intake and drug-induced hair loss. Captopril has a sulphydryl group (SH). This functional group permit the drug to bind cysteine, homocysteine and glutathione and other proteins with SH group. Some researchers suggested that this group increases insulin sensitivity and is responsible for antioxidant drug properties. However, today it is often believed that this group is more responsible for the characteristic side effects than the additional benefits. The impact of functional group on drug-induced alopecia is rather unlikely. The chosen drug-perindopril and described by Johum et al.-enalapril (11) have carboxyl functional group. They form the biggest ACE inhibitors subgroup and are pro drugs (20). This fact excludes the impact of functional groups on drug-induced alopecia due to ACE inhibitors therapy. New methods of drug-induced hair loss prevention and broaden research are necessary in aspect of patient discomfort and extensive use of ACE inhibitors. At the conclusion, hair play an important role in human life, they shaping body image and have impact on interpersonal relationships. So that, drug-induced alopecia is so enormous clinical problem and often a stigma of the disease. 1. Atorvastatin damages the hair follicles leading to the drug-induced alopecia. The hair loss mechanism is telogen with tendency to spontaneous remission. Clinical outcome involve focal hair thinning and fluffiness reduction and is moderate. 2. Perindopril has also toxic effect on the hair follicle and is responsible for drug-induced alopecia. Observed telogen effluvium is chronic and associated with prolonged therapy. 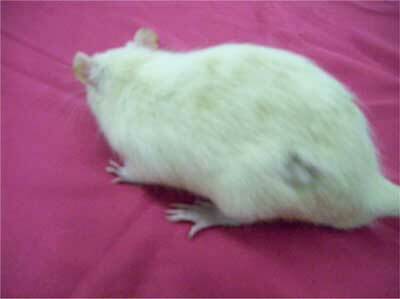 In rats clinical outcome is late and involve hair shedding on the lateral body sides. 1. Trüeb RM: Diffuse hair loss. [In:] Blume-Peytavi U, Tosti A, Whiting DA, Trüeb R, editors. Hair growth and disorders. Berlin Heidelberg: Springer-Verlag 2008; 269. 2. Shapiro J: Hair loss in women. N Eng J Med 2007; 357: 1620-1630. 3. Herold G: Zaburzenia gospodarki lipidowej. [W:] Gerd H, red. Medycyna wewnętrzna. Wyd. IV, Warszawa, Wydawnictwo Lekarskie PZWL 2007; 827-836. 4. Llau ME, Viraben R, Montastruc JL: Drug-induced alopecia: review of the literature. Therapie 1995; 2: 145-150. 5. Keplar KE: Alopecia, Hirsutism and Hypertrichosis. In: Tisdale JE, Miller DA, editors. Drug-Induced Diseases. Prevention, detection and management. 2nd ed. Bethesda: American Society of Health-System Pharmacists 2010; 135-179. 6. Segal AS: Alopecia associated with atorvastatin. Am J Med 2002; 113: 171. 7. Szostak WB, Cybulska B: Prewencja chorób sercowo-naczyniowych – postępy 2009. Med Prakt 2010; 6: 18-32. 8. Koh KK, Sakuma I, Quon MJ: Differential metabolic effects of distinct statins. Atherosclerosis 2011; 215: 1-8. 9. Kostanecki W: Choroby włosów. Warszawa, Wyd. PZWL 1979. 10. Robins DN: Case reports: alopecia universalis: hair growth following initiation of simvastatin and ezetimibe therapy. J Drugs Dermatol 2007; 6: 946-947. 11. Jochum F, Reitz M, Willing R et al. : Reversible alopecia medicamentosa due to ACE-inhibitor therapy in children. Monatsschr Kinderheilkd 2000; 148: 235-238. 12. Motel PJ: Captopril and alopecia: a case report and review of known cutaneous reactions in captopril use. J Am Acad Dermatol 1990; 23: 124-125. 13. Leaker B, Whitworth JA: Alopecia associated with captopril treatment. Aust N Z J Med 1984; 14: 866. 14. Golik A, Zaidenstein R, Dishi V et al. : Effects of captopril and enalapril on zinc metabolism in hypertensive patients. J Am Coll Nutr 1998; 17: 75-78. 15. Abu-Hamdan DK, Desai H, Sondheimer J et al. : Taste acuity and zinc metabolism in captopril-treated hypertensive male patients. Am J Hypertens 1988; 1: 303-308. 16. Zumkley H, Bertram HP, Vetter H et al. : Zinc metabolism during captopril treatment. Horm Metab Res 1985; 17: 256-258. 17. Toruniowa B, Wierciński J, Chodorowska G, Jurkowska A: Badania poziomu cynku w surowicy krwi i we włosach w przebiegu łysienia rozlanego. Przegl Dermatol 1994; 81: 175-182. 18. Peczkowska M: Influence of angiotensyn I converting enzyme inhibitors on selected parameters of zinc metabolism. Pol Arch Med Wewn 1996; 96: 32-38. 19. Kotsaki-Kovatsi VP, Koehler-Samouilidis G, Kovatsis A, Rozos G: Fluctuation of zinc, copper, magnesium and calcium concentrations in guinea pig tissues after administration of captopril. J Trace Elem Med Biol 1997; 11: 32-36. 20. Opolski G, Filipiak KJ: Właściwości farmakologiczne inhibitorów konwertazy angiotensyny. [W:] Opolski G, Filipiak KJ, red. Leki hamujące układ renina-angiotensyna-aldosteron. Wyd. I, Wrocław, Urban & Partner 2000; 46-61.